The giving away of jerseys, shoes, and other accessories by players after games or practices is nothing new. It&apos;s a kind gesture from the athlete to his or her fans that helps strengthen loyalty and gives them a piece of memorabilia that they can cherish or toss on eBay for some extra coin. 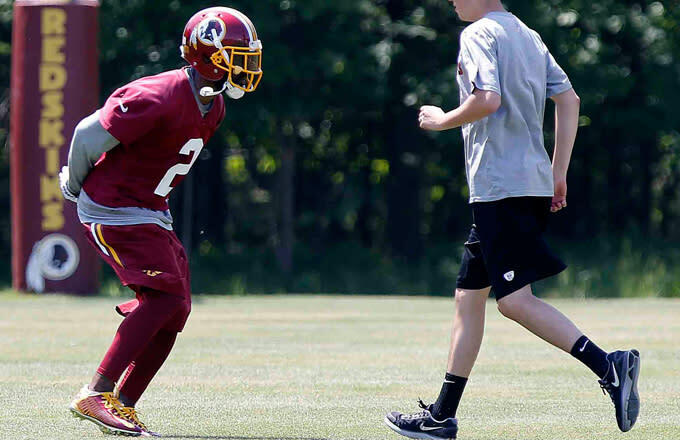 For Redskins&apos; cornerback, DeAngelo Hall, he played the role of good guy athlete and gave away a pair of his cleats to a fan after the end of a recent practice in Richmond, Virginia. Unfortunately for Hall, he forgot those cleats contained something he really needed, his custom insoles. So Hall took to Twitter to reach out to the person asking for his cleats back and in exchange, Hall promised to give the fan a little something extra for their troubles. Hopefully, the fan does the right thing and gives Hall back his insoles. I&apos;ll give you something extra special like a game jersey or tics to a game. Thanks and sorry for the inconvenience.